"Foodie Friday" featuring Dough - The Datz Bakery! It’s a very special edition of Foodie Friday – Dine Tampa Bay kicks off tonight! We are starting the festivities with Dough – a new eatery with old roots. OK – not that old – Dough’s sister restaurant, Datz has only been open since 2009, but it feels like we’ve known it a lifetime am I right? Anyway, Dough opened this April and it recently launched a dinner menu alongside a wine and beer list. Yippee! Think of this as Datz with a lighter touch. The food is still high quality, unique and delicious, but there aren’t any gigantic burgers or monster Kentucky Colonel Bowls on this menu. So what will you find? Oh my, let me tell you. Quite a lot for a $25 price point, that’s what! Dough’s first course is a cheese lover’s delight. 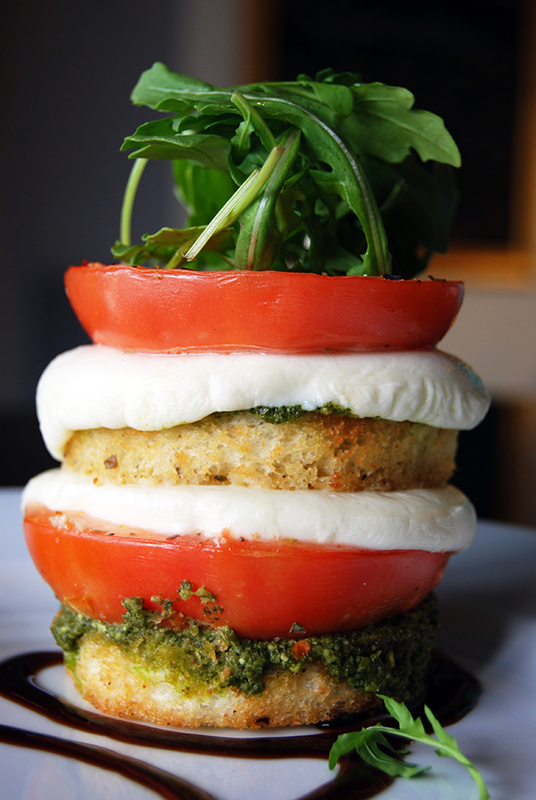 Choose from a baked brie smothered in sundried tomato tapenade and toasty pinenuts, a well-appointed cheese plate, and a delicious caprese stack that features thick slabs of fresh mozzarella, house-made pesto and juicy tomatoes. Hard to pick a favorite here, but we’ll go with the cheese plate based on one advantage it has: mozzarella and goat cheese mousse. This stuff is straight up spreadable heaven! We’ve never had anything like it before and it’s totally worth trying. For course 2, we get to sample some of Dough’s amazing baking. They offer a “grilled” Monte Cristo – smoky ham and Jarlsberg cheese layered between buttered, grilled, house-made Amish milk bread (think amazingly soft, slightly sweet white bread). The secret weapon here is an amazing scallion-tomato mayo. You will have dreams about this stuff. It adds an amazing layer of flavor! Also on course 2: candied bacon/jalapeno pizza on a house-made sourdough crust. 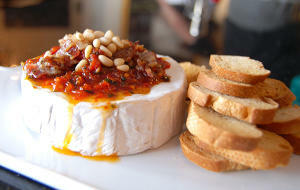 Roasted garlic, smoked gouda, and fresh mozzarella round out the toppings and create a praiseworthy palate of flavors. The third option for the entrée course is Kim’s Kale Salad: fresh Tuscan kale, dried cranberries, pine nuts, red onion, shaved parmesan, and house-made toasted coriander-orange balsamic vinaigrette. You can top it with your choice of chicken or steak. It can be hard to get excited about kale, but I have to say I’d order this again and again – the flavor balance is spot on and the dressing is killer! 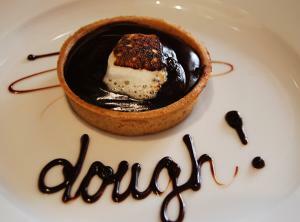 On to dessert and boy, oh boy, this is the course of all courses at Dough! For Dine they are offering a choice of a Campfire Tart (cold smoked Valrhona ganache in a graham cracker crust topped with a house-made marshmallow and a drizzle of local honey)and a naughty Caramel-Bourbon boozy shake (vanilla soft serve, Buffalo Trace bourbon, caramel, whipped cream and a Moonshine cherry!). This is a split decision for us. Both are awesome, and honestly, if you don’t fill a box of pastries on the way out the door you have the world’s best willpower! If you haven’t checked out the savory side of Dough, now is the time. We love this new kid on the block and we are so stoked to introduce them during Dine week! Hot tip: the Datz/Dough complex is packed on the weekends and parking can be a challenge. Have your Dine experience on a Monday or Tuesday to avoid the hassle.